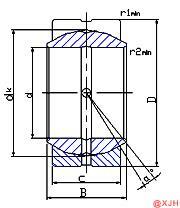 Spherical Plain Bearing GEF.ES SERIES generates friction during operation due to the contact between the journal and the bearing bush, causing the surface to heat up and wear and even “bite”. Therefore, when designing the bearing, the bearing material should be made of sliding bearing material with good friction reducing property, suitable lubricant and appropriate supply method should be used to improve the structure of the bearing to obtain thick film lubrication. (1) When the bearing load is large and the rotation speed is low, the grease with a small penetration degree should be selected, and vice versa. High-speed bearings use grease with a small degree of penetration and good mechanical stability. Special attention is paid to the lower viscosity of the base oil of the grease. (2) The dropping point of the selected grease is generally higher than the working temperature of 20-30 ° C. In the case of continuous operation at high temperature, be careful not to exceed the allowable operating temperature range of the grease. (3) Spherical Plain Bearing GEF.ES SERIES should work with water-based or wet conditions to select calcium-based, aluminum-based or lithium-based greases with good water resistance.